Thus modern ALM includes the allocation and management of assets, equity, interest rate and credit risk management including risk overlays, and the calibration of firmwide tools within these risk frameworks for optimisation and management in the local regulatory and capital environment. Often an ALM approach passively matches assets against liabilities (fully hedged) and leaves surplus to be actively managed. Liquidity risk: the current and prospective risk arising when the bank is unable to meet its obligations as they come due without adversely affecting the bank's financial conditions. From an ALM perspective, the focus is on the funding liquidity risk of the bank, meaning its ability to meet its current and future cash-flow obligations and collateral needs, both expected and unexpected. This mission thus includes the bank liquidity's benchmark price in the market. Interest rate risk: The risk of losses resulting from movements in interest rates and their impact on future cash-flows. Generally because a bank may have a disproportionate amount of fixed or variable rates instruments on either side of the balance-sheet. One of the primary causes are mismatches in terms of bank deposits and loans. Capital markets risk: The risk from movements in equity and/or credit on the balance sheet. An insurer may wish to harvest either risk or fee premia. Risk is then mitigated by options, futures, derivative overlays which may incorporate tactical or strategic views. Currency risk management: The risk of losses resulting from movements in exchanges rates. To the extent that cash-flow assets and liabilities are denominated in different currencies. Funding and capital management: As all the mechanism to ensure the maintenance of adequate capital on a continuous basis. It is a dynamic and ongoing process considering both short- and longer-term capital needs and is coordinated with a bank's overall strategy and planning cycles (usually a prospective time-horizon of 2 years). The ALM function scope covers both a prudential component (management of all possible risks and rules and regulation) and an optimization role (management of funding costs, generating results on balance sheet position), within the limits of compliance (implementation and monitoring with internal rules and regulatory set of rules). ALM intervenes in these issues of current business activities but is also consulted to organic development and external acquisition to analyse and validate the funding terms options, conditions of the projects and any risks (i.e., funding issues in local currencies). Today, ALM techniques and processes have been extended and adopted by corporations other than financial institutions; e.g., insurance. For banking institutions, treasury and ALM are strictly interrelated with each other and collaborate in managing both liquidity, interest rate, and currency risk at solo and group level: Where ALM focuses more on risk analysis and medium- and long-term financing needs, treasury manages short-term funding (mainly up to one year) including intra-day liquidity management and cash clearing, crisis liquidity monitoring. The responsibility for ALM is often divided between the treasury and Chief Financial Officer (CFO). In smaller organizations, the ALM process can be addressed by one or two key persons (Chief Executive Officer, such as the CFO or treasurer). The vast majority of banks operate a centralised ALM model which enables oversight of the consolidated balance-sheet with lower-level ALM units focusing on business units or legal entities. Most global banks have benchmarked their ALM framework to the Basel Committee on Banking Supervision (BCBS) guidance 'Principles for the management and supervision of interest rate risk'. Issued in July 2004, this paper has the objective to support the Pillar 2 approach to interest rate risk in the banking book within the Basel II capital framework. In January 2013, the Basel Committee has issued the full text of the revised Liquidity Coverage Ratio (LCR) as one of the key component of the Basel III capital framework. This new coming ratio will ensure that banks will have sufficient adequacy transformation level between their stock of unencumbered high-quality assets (HQLA) and their conversion into cash to meet their liquidity requirements for a 30-calendar-day liquidity stress scenario (and thus hoping to cure shortcoming from Basel II that was not addressing liquidity management). Limits on the mix of balance sheet assets (loans by credit category, financial instruments...) considering levels of risk and return and thus guided by annual planning targets, lending licence constraints and regulatory restrictions on investments. Note that the ALM policy has not the objective to skip out the institution from elaborating a liquidity policy. In any case, the ALM and liquidity policies need to be correlated as decision on lending, investment, liabilities, equity are all interrelated. The objective is to measure the direction and extent of asset-liability mismatch through the funding or maturity gap. This aspect of ALM stresses the importance of balancing maturities as well as cash-flows or interest rates for a particular set time horizon. For the management of interest rate risk it may take the form of matching the maturities and interest rates of loans and investments with the maturities and interest rates of deposit, equity and external credit in order to maintain adequate profitability. 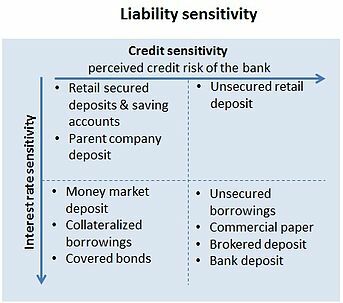 In other words, it is the management of the spread between interest rate sensitive assets and interest rate sensitive liabilities.. Measuring liquidity position via liquidity gap analysis is still one of the most common tool used and represents the foundation for scenario analysis and stress-testing. To do so, ALM team is projecting future funding needs by tracking through maturity and cash-flow mismatches gap risk exposure (or matching schedule). In that situation, the risk depends not only on the maturity of asset-liabilities but also on the maturity of each intermediate cash-flow, including prepayments of loans or unforeseen usage of credit lines. Defining the relevant maturities of the assets and liabilities where a maturing liability will be a cash outflow while a maturing asset will be a cash inflow (based on effective maturities or the 'liquidity duration': estimated time to dispose of the instruments in a crisis situation such as withdrawal from the business). For non maturity assets (such as overdrafts, credit card balances, drawn and undrawn lines of credit or any other off-balance sheet commitments), their movements as well as volume can be predict by making assumptions derived from examining historic data on client's behaviour. In dealing with the liquidity gap, the bank main concern is to deal with a surplus of long-term assets over short-term liabilities and thus continuously to finance the assets with the risk that required funds will not be available or into prohibitive level. As these instruments do not have a contractual maturity, the bank needs to dispose of a clear understanding of their duration level within the banking books. This analysis for non-maturing liabilities such as non interest-bearing deposits (savings accounts and deposits) consists of assessing the account holders behavior to determine the turnover level of the accounts or decay rate of deposits (speed at which the accounts 'decay', the retention rate is representing the inverse of a decay rate). To place these funds in the longest-dated time bucket as deposits remain historically stable over time due to large numbers of depositors. To assign maturities and re-pricing dates to the non-maturing liabilities by creating a portfolio of fixed income instruments that imitates the cash-flows of the liabilities positions. The 2007 crisis however has evidence fiercely that the withdrawal of client deposits is driven by two major factors (level of sophistication of the counterparty: high-net-worth clients withdraw their funds quicker than retail ones, the absolute deposit size: large corporate clients are leaving faster than SMEs) enhancing simplification in the new deposit run-off models. A surplus of liabilities over assets creates the need to find efficient uses for those funds, i.e. a positive mismatch that is not a wrong signal (generally a rare scenario in a bank as the bank always has a target return on capital to achieve and so requires funds to be put to work by acquiring assets) but only means that the bank is sacrificing profits unnecessarily to achieve a liquidity position that is too liquid. This excess of liquidity can be deployed in money market instruments or risk-free assets such as government T-bills or bank certificate of deposit (CDs) if this liability excess belongs to bank's capital (the ALM desk will not take the risk of putting capital in a credit-risk investment). Simplified indication on the extent to which a bank is funding liquid assets by stable liabilities. A level of 85 to 95% indicating correct level. As an echo to the deficit of funds resulting from gaps between assets and liabilities the bank has also to address its funding requirement through an effective, robust and stable funding model. The banking system needs to deal with fierce competition of the shadow banking system : entities or activities structured outside the regular banking mechanism that perform bank-like functions such as credit intermediation or funding sources (with bank corporate clients with refinancing rates lower or similar to the banks themselves and of course without financial regulatory restrictions and risk control). Size of the shadow banking system is evaluated to $67 trillion in 2011 according to the Financial Stability Board (FSB), this estimation is based on a proxy measure for non-credit intermediation in Australia, Canada, Japan, Korea, UK, US and the Euro area. After 2007, financial groups have further improved the diversification of funding sources as the crisis has proven that limited mix of funds may turn out to be risky if these sources run dry all of a sudden. The asset contribution to funding requirement depends on the bank ability to convert easily its assets to cash without loss. From customers and small businesses and seen as stable sources with poor sensitivity level to market interest rates and bank's financial conditions. Dependencies to endogenous (bank specific events such as formulas, asset allocation, funding methods...) / exogenous (investment returns, market volatility, inflation, bank ratings...) factors that will influence the bank ability to access one particular source. Once the bank has established a list of potential sources based on their characteristics and risk/ reward analysis, it should monitor the link between its funding strategy and market conditions or systemic events. As the bank should not assume that business will always continue as it is the current business process, the institution needs to explore emergency sources of funds and formalise a contingency plan. The purpose is to find alternative backup sources of funding to those that occur within the normal course of operations. Dealing with Contingency Funding Plan (CFP) is to find adequate actions as regard to low-probability and high-impact events as opposed to high-probability and low-impact into the day-to-day management of funding sources and their usage within the bank. This assessment is realised in accordance with the bank current funding structure to establish a clear view on their impacts on the 'normal' funding plan and therefore evaluate the need for extra funding. In addition, analysis are conducted to evaluate the threat of those stress events on the bank earnings, capital level, business activities as well as the balance sheet composition. Funding report summarises the total funding needs and sources with the objective to dispose of a global view where the forward funding requirement lies at the time of the snapshot. The report breakdown is at business line level to a consolidatedone on the firm-wide level. As a widespread standard, a 20% gap tolerance level is applied in each time bucket meaning that gap within each time period defined can support no more than 20% of total funding. This is the concept of Fund Transfer Pricing (FTP) a process within ALM context to ensure that business lines are funded with adequate tenors and that are charged and accountable in adequation to their current or future estimated situation. Crockford, Neil (1986). An Introduction to Risk Management (2nd ed.). Woodhead-Faulkner. 0-85941-332-2. Moorad Choudhry (2007). Bank Asset and Liability Management - Strategy, Trading, Analysis. Wiley Finance. This page was last edited on 18 January 2019, at 18:19 (UTC).